Gaëlle Vallée-Tourangeau a professor of Behavioural Science, director of research for the department of management at Kingston University Business School and head of the Decision, Attitudes, Risk and Thinking research group. She studied at Paris Ouest University (1998, MSc Social Psychology) and the University of Hertfordshire (2004, PhD) then was a lecturer at the Leeds University Business School (2001-2004) and the University of Toulouse (2004-2009) before joining Kingston University in 2009. Her expertise lies in behavioural sciences and her research focuses on the role played by social, physical and/or mental processes in decision-making, reasoning and uncertainty judgements, both in the lab and in applied settings. Specifically current projects include an investigation of the role of intuitive thinking in probability judgements, an investigation of the role of autonomous drive in healthcare workers' vaccination decisions and vaccination advocacy and an investigation of systemic thinking in risky choice framing effects. Her work has been published in leading psychology journals such as the Journal of Experimental Psychology - General, Psychological Science, Cognition, Memory & Cognition and Acta Psychologica among others. 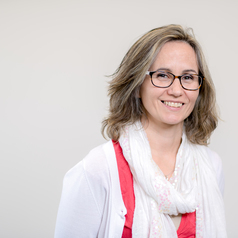 Her research has been funded by the Fyssen foundation (2004), the French National Research Agency (2008), the Leverhulme Trust (2011), and Sanofi-Pasteur (2013).